The technology that has developed since the 1970s has advanced on an unpredictable scale. And there are many games in history that have directed the development of gaming for the better. We are going to explore the best Retro Games that will make you appreciate just how far video games have come. Some of the games mentioned today have played a role in further developing the gaming industry for the better. If it wasn’t for them, games my like very different today! Other Games have had a long, successful history behind them and we should appreciate their humble beginnings. Nevertheless, all games on this list have made a massive impact on gamers lives. The first game on our list is famous for being one of the first games ever! Pong was developed by Atari and released in 1972. With no story, characters or even any particular level design, Pong is a very basic game. This game serves as a virtual tennis experience where you can rally a white pixel across the screen. Don’t expect hours and hours of entertainment from this golden oldie however, I recommend you check it out. In fact, you can play the game online here! Time for a bit of an upgrade from Pong. Next up is a game that is a lot more challenging. Space Invaders is equally as famous and acted as a big influencer in the gaming industry. Also developed by Atari and released in 1978, the game made its way into arcades, some of which were opened purely for installing Space Invaders machines! By 1981, Space Invaders arcade games had seen four billion quarters enter their machines (or $1 million to be exact) making it the best selling video game and highest-grossing product of its time. Making the arcade game available for Atari 2800 only increased the sales more – no wonder you still hear about Space Invaders today! Duck Hunt was a revolutionary game that allowed you to point a controller at the screen in order to shoot your target. For those that owned a Wii Console and played Wii Play, you may remember Duck Hunt being one of the various mini games you could play. Nothing compares to the beauty of the pixelated Ducks flying across the screen on NES. Not to mention the zapper you played with to shoot the ducks! This was one of the first motion-sensored games available to play at home and served as another step in redefining what home entertainment meant. One of the most popular gaming series, fans have been playing Mario Kart Games for over 25 Years! We recently explored the History of Mario Kart. Super Mario Kart was the beginning of a long racing career for Mario characters and persuaded many other studios to give their own protagonist some racing games too! You’ll have to bare in mind that this game doesn’t have the HD graphics that the latest installments have however, the 2D cars and minimal detail will give you all the retro feels that you need. Like Mario Kart, Pokemon was another game that introduced many of us into the world of gaming. Even people who don’t play games have played a Pokemon game at some point in their lives whether that’s Pokemon Leaf Green or Pokemon Go. Nevertheless, it is one of the most successful gaming series in history. Today’s world is full of merchandise, animes, fan clubs and so much more Pokemon themed stuff. Looking at the scale of the industry today, it’s hard to think that it all spawned from two, small GameBoy Games: Red and Blue. The games were released in 1996 and by 1998, the Pokemon franchise was already worth $4 Billion in Japan! Nintendo have sold over 219 Million copies of their Pokemon games since the start. It has always been useful to own a fighting game; either you need to solve an argument or you want to prove yourself as superior. Street Fighter was one of those games that never failed to be entertaining. With its first arcade game released in 1987, Street Fighter introduced the majority of us to the playing technique more commonly known as “Button Mashing”. There is where you don’t quite know how to attack your opponent but nevertheless, through the mindless pressing of random buttons, you can still lower their health. Capcom’s latest game was released for Nintendo Switch this year. Hopefully, we’ll have worked out the controls by now! There have been many great Skateboarding games in history. I picked this game in particular because of how crazy the tricks are! Watching the video above, you’ll see how physically impossible some of those moves are. Street Sk8ter was the hit PS1 game that boasted crazy level designs and even crazier tricks to perform. The best 90s vibes emanate from this game as you choose your once fashionable character and their skateboard. Everyone is dressed as if they are about to appear in a music video! Seeing as Ubisoft has just released Rayman Legends on Nintendo Switch (and it is awesome), now is a great time to explore the past of our limbless hero. Rayman Legends has received a great reception since its release in 2013 and it’s all thanks to his heroic past. Rayman has been throwing punches since 1995 and has made many enemies since. His most annoying yet adorable enemies have got to be the Raving Rabbids. Thanks to these guys, a number of great party games have been released on Wii. So if you have time to go back to the first game, then definitely try all the instalments. I have lots of great memories of these games. This game pioneered the industry towards the future. Doom was one of the first games to introduce first person shooter mode – one of the most popular game modes to date. Without Doom, we wouldn’t have experienced those special moments on Call of Duty or Team Fortress 2. Not only did it popularise the unique game mode, it was also a brilliant game! This is all about destroying as many Demons as you possibly can as the gates to hell have opened on the planet Mars. It was also a game that boasted great 3D graphics in a time before many consoles could offer that. Doom has had a number of installments since 1993 and is even being developed for VR! Watching the trailer that Bethesda produced this year, it’s incredible to see the development that Doom has had. We thought the version in 1993 was scary but it doesn’t even compare to 2017’s! Our favourite explorer, Laura Croft, has been blessing us with her adventures since 1996. She is particularly famous for being one of the few female protagonists of her time. Her angular body shape made her particularly prominent with young, pubescent boys (If you catch my drift). Growing up with an older brother playing this game, our adventures were frequently disturbed by his childish laughter. 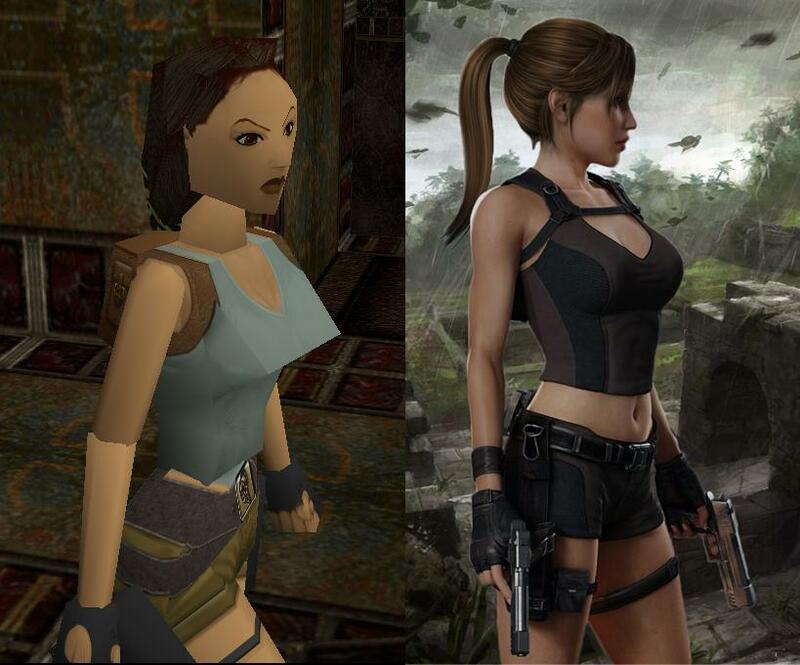 The Evolution of her design is astounding! Just look at how much detail has been put into her character! Tomb Raider has been released for a number of consoles including GameBoy Colour and PS1 and is still popular today with a new movie announced for 2018! So there’s out Top 10 Retro Games that you have got to try! Anymore games that you think are worth a play? Let us know in the comments!